With propagation on 10m being so good I have been trying to make some contacts using the Albrecht AE2990AFS multimode handheld using a whip antenna. No luck so far, however. 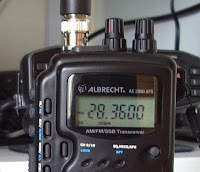 One annoying aspect of the Albrecht is that it tunes in 10kHz steps since it is essentially a CB radio. There is a step control that lets you choose 1kHz or 50Hz tuning steps, but this only works within one 10kHz or 1kHz range. You can't tune the whole band in these smaller steps. Not only that but the clarifier control (better known to hams as RIT) shifts only the receive frequency and doesn't have a centre detent so you can never be sure you are calling a station on his exact frequency. An eBay seller of the Super Radio SS-301 - which seems to be the same radio as the Albrecht under another name - claims that the clarifier works on both TX and RX. So there is presumably a modification that would make the clarifier work like a VXO. But I'm darned if I can find any details of it. Has anyone made such a modification to this radio? You may want to look for MODS for similar models. This radio has been branded to about 5 or 6 different companies.